If you missed my early fall potting bench decorated with mums, you can view it here. The mums that were available in my isolated northern Minnesota locale were already pretty advanced in early September, but I bought them anyway. Some years the temps get too cold to even bring them into full bloom by late September. For today's new arrangement, I went rustic with a couple of old kerosene lanterns that I just purchased for $2 and $3 at a local antique shop yesterday. The glass was missing, but I can still use them for display. I like them with a little Spanish Moss and small pumpkins. Rust and orange make a good combination! On the right side of the potting bench/sink I put a galvanized bucket of gourds and a vintage berry sieve with Indian corn. This is the whole sink top display. This potting sink was a great buy last spring. It is great for outdoor decorating! My whole display will be put into winter storage very shortly after Halloween. Snow can be expected in November. The wispy grasses are Mexican Feather Grass or Ponytail Grass from the summer season. I love the way they sway in the autumn winds. I hope you are enjoying my fall decor this year! Well I just love your potting bench. So hard for me to imagine it that cold yet. We are all in shorts still with it in the upper 80s today. I am ready for a cool down. I adore the indian corn idea. I am not ready for the cold stuff to hit, so hopefully it will hold off until later November here. I remember your snow photos from last year and you definitely get hit hard with the white stuff! You potting bench looks festive all dressed up for fall. The lanterns are adorable with baby pumpkins nested inside! I hope you enjoyed this gorgeous late September day, Carlene. Looks really good, Carlene!! Love the old lanterns! I am reading all your fall decorating posts & thanks for the inspiration to use my 90 y/o aunt's mother's gray graniteware canning funnel (inverted) into a votive candle cup holder. Your candy corn funnels are so cute. The potting bench looks great all decked out for Fall. Very pretty potting bench. Like the lanterns with the little pumpkins in them. Good Morning Carlene, I adore your old kerosene lanterns and they look lovely filled with Spanish moss and small pumpkins. It is certainly getting much colder here in England, we are expecting our first frost this week, brrrrr. Love your potting bench, what a great idea with the sink. It's decorated so nice for fall too! Very clever display ideas! Love the lanterns. Carlene I love the update to your potting bench. Great details and adore the old lanterns. I tried several times to leave a comment this morning and my computer wouldn't let me! I love it Carlene! You always find the most unique ways to display your fun finds! Love your decorations Carlene.You have so many unusual ideas. That potting bench has been a lot of fun to decorate. I too, love the Mexican feather grass. I am thinning mine out and planted one in a pot and it looks good. Happy Fall to enjoy before the snow gets there. "Pop-of-orange" is my new favorite decorating theme . . .
Hi Carlene! Love your fall touches. I'm finally following your blog, I have no idea how I've missed it all this time! 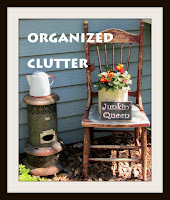 I've met you on hometalk (The Junky Chic Queen) and I've really enjoyed all your posts there. I'm excited about checking out some of your older posts here too. Hope you'll stop by my blog sometime soon!